Hello, "The fabulous life of..." readers! I'm Gagan, author of the blog "Of Peacocks and Paisleys" and I'm here to get the party going! Set the mood with: Some peppy music** in the background, get that fireplace going in lieu of a bonfire! Bring out those reds, those yellows those greens---we love color! Other ways to make it memorable: Make sure you dress in your festive best, but also make sure you're dressed to get up and booooogie, for once those beats start, you won't want to just sit and look pretty! Lohri is all about fun and gaiety......let your hair down, put away your crystal and fine china, let the kids run loose, turn up the volume (or if you have singers in the crowd, let them shine), add plenty of laughter and keep the chai coming! Don't forget to hand your guests paper-cones filled with peanuts and rewari as shagan (throw in some coins for the kids). **Da music: You can't go wrong with traditional music, but in case you feel the need to jazz it up a bit, I love this band's funky fusion sound. Thanks for having me over!! it's So fun to be doing this, hope you're having a blast in Delhi!!! @Sharon: Thank you! Howz the cold in Pune? @Jemina: Thank you, Happy Lohri--no celebration is complete without the food (especially in India!) :). @VV: yup, peacocks and paisleys are right on top of my list of favorite things too! Thanks for your sweet comment. Lohri looks like so much fun, I'm wondering if I could add it to my annual party rituals. Lovely post, perfect for the occasion. Happy Lohri to all. Happy Lohri! Some fresh pakora would be great too at a celebration! Gagan ~ as usual.. a fantastic post. I loved all the pictures here and all the ideas.. Happy Lohri! That popcorn looks so yummy! Oh, and CnC living: pakoras sound yumm!! Happy Lohri to both of you ladies.I love these guest posts happening here.Getting to know great blogs and people. Great post. Enjoyed reading about Lohri. Happy Lohri, just what I need to cheer me up! oh this is great. My mom posted a Happy Lohri message on FB but I am just not familiar with this one. I love that you provided some info on this :) thanks! The popcorn looks great. Thanks for sharing. See you soon Tanvi. The holidays just keep on coming! I had actually never heard of Lohri before, so thanks for the lesson! Miss you Tanvi - hope you're having a wonderful time! 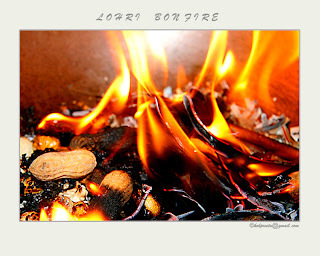 Happy Lohri :) Have to go to my aunty's house tonight for a Lohri dinner so will be relishing all the ummy food then! Happy Lohri to you too darling.. Happy Lohri! the weather's suddenly changed here...Can do without a sweater right now! quite crazy that! This is so interesting! I've loved reading these guest posts (although I am anxious to see your photos and hear your stories about your vacationing!) I would love to throw a party with paper cones and goodies to fill them up with! i love this blog! so great! come visit me and follow if you'd like... i leave for my Australia adventure in just 2 days!!! Nice blog! I'm a fan of Sarson da saag Everything looks amazing! Thanks for sharing these wonderful photos. Happy lori,and what a great post...gagan you are amazing! Lovely post as usual. Happy Lohri to you too.